The Cuisinart MCP22-24N 10 in. skillet features Heat Surround™ Technology which allows even heat distribution across the bottom and side walls of the cookware. It has core of pure aluminum in bonded to stainless steel interior for unsurpassed cooking performance. 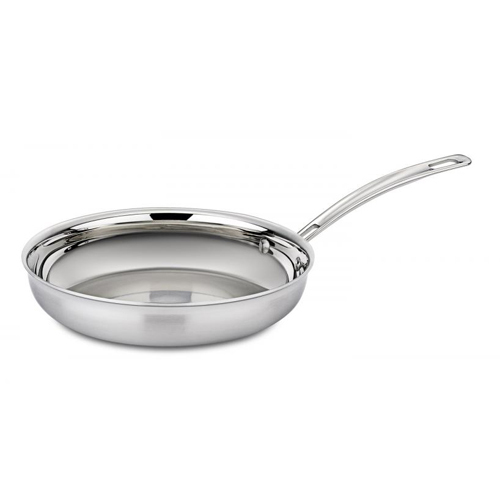 The pan has Cool Grip™ solid stainless steel riveted handle which offers perfect balance to provide exceptional control when gently tossing food and stays cool on the stovetop. The MCP22-24N MultiClad Pro Stainless skillets have sloped sides and wide flat bottoms design which is ideal for frying fish, sauteing onions and garlic, or browning big batches of chicken. The open design of the skillet provides maximum cooking surface and makes it easy to rearrange food as it is cooking. Its stainless steel cooking surface does not react to acidic foods or alter natural flavors. The Multiclad Pro Triple Ply Stainless 10In Skillet has many exciting features for users of all types. You can extend the lifetime of your Multiclad Pro Triple Ply Stainless 10In Skillet with the purchase of a FactoryOutletStore Factory Protection Plan. See the Multiclad Pro Triple Ply Stainless 10In Skillet gallery images above for more product views. The Multiclad Pro Triple Ply Stainless 10In Skillet is sold as a Brand New Unopened Item.